Mr and Mrs. Banh Mi Bento, originally uploaded by sherimiya ♥. Today was such a fabulous day; I really would call it the first day it felt like spring. The sun was out in a blue cloudless sky ALL day, and it was warm enough to leave the jacket in the car. A whole bunch of things are blooming in my garden, including volunteers I forgot about from last year. I actually have green onions that had been clinging to life all through winter, and now they are growing dark green and tall again. My sweet peas went to seed and now I've got vines shooting up the tomato cages. How's your garden? Today we went out for lunch and at the same time decided to pick up some banh mi (Vietnamese sandwiches) for my boy's bento tomorrow. Score! He gets a pork banh mi, which after I cut into pieces short enough to fit in the tiffin, looked like faces. So what could I do but finish them off with eyes and headgear? I also managed to squeeze in a whole tangerine, a strawberry, a few grapes and a sprig of broccoli. Perfect! This tiffin came with a top tier, but I'm only using the bottom section today -- which means I can fill it up higher. I separated the sandwiches in wax paper to keep them away from the fruits. It's not the first time I've put a sandwich in the tiffin; the round sandwich thins or bagels also work well. You may have heard about the Spring 2010 Bento Contest going on, hosted by Maki of Just Bento, Thomas and Erico of Bento & Co, and Mook of French Bento. 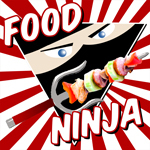 The finalists have been selected, and my Spring Momiji Bento is one of the final 15! The voting has now been opened up to the public, for selection of the top 10 Spring Bento. If you haven't already, please stop over and vote there, if you get a chance! My bento is #051 Happy Little Bento. Take a look at them all; they are all beautiful! plus those bahn mi pieces look soooo tasty. glad to hear you are having lovely weather and your garden is bursting to life! and congrats again on top 15, what a beautiful box you submitted! 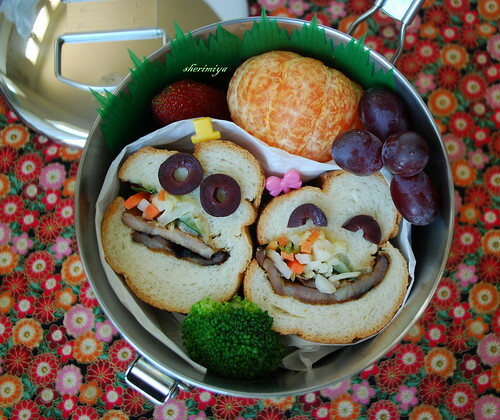 Congrats on being a finalist in the spring bento contest! Your entry is lovely! Thank you Jenn!! Appreciate it! Thanks megan, they are funny aren't they? I feel like I've neglected the banh mi; it's been so long! I heard you folks had great weather out there too! Thanks for the congrats, the same on your butterfly -- it's so cool to be in such fantastic company!! Thank you ehmeelu, so sweet of you! Love the sandwich faces! And I enjoy hearing about everyone's gardens. Sheri, I want to pass 2 awards for you. Please pick it up here. Thanks! Bentobird, I love hearing about yours too. Peonies are another fave of mine! I did try to grow them but was never successful. I love the double flowers with the overflowing petals, and esp the scented ones :) Thank you for your lovely comment! Haha, thanks a lot Susan!